Use our Interactive GIS Viewer. Printed parcel maps are not yet available through the Interactive GIS Viewer. Parcel maps may be obtained at the GIS office. Research whether you live in a FEMA Floodplain? What is GIS? 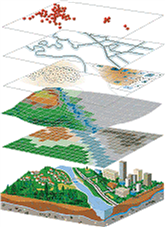 GIS is a collection of computer hardware, software, and geographic data for capturing, managing, analyzing, and displaying all forms of geographically referenced information. Read more about the benefits of GIS. The application of GIS is unlimited. It has been used to solve problems as diverse as where to place self-service coin counting machines, how to improve the yield of crops in a traditional Tuscan vineyard, or how to manage an entire city enterprise. Check out our new Interactive Map Gallery featuring applications for floodplain information, finding parks, election information, and municipal hall locations.